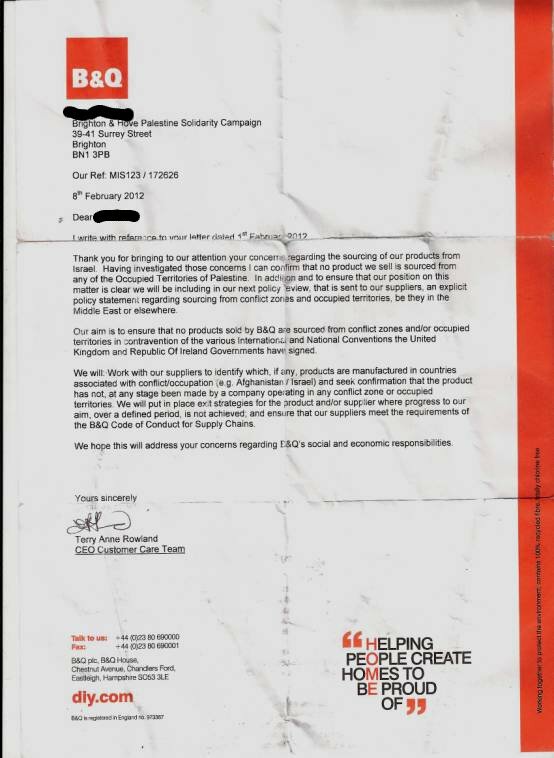 Since April 2012 Corporate Watch, and campaigners from the Brighton and Hove Palestine Solidarity Campaign, have been in correspondence with B&Q over its sale of products manufactured by Keter Plastics, an Israeli company with a global reach which has a factory in the illegal Barkan settlement industrial zone in the occupied West Bank. ”We are not sourcing from the Barkan site and have received appropriate guarantees from Keter to verify this claim. Barkan, attached to the residential settlement of Ariel, was established in 1982 on the land of the Palestinian villages of Haris, Bruqin and Sarta. The industrial zone hosts a disproportionate number of factories that pollute the environment. For example, waste from Barkan runs down the hillside of the Al-Matwi valley, damaging Palestinian farmland. Palestinian labourers are employed in the industrial zone and are paid, in several documented instances, below the minimum wage and are denied the right to unionise. Corporate Watch would like to congratulate B&Q for its policy of avoiding goods manufactured in Barkan industrial zone. However, we would like to point out that this policy does not go far enough. By continuing to source from Keter, B&Q is directly contributing to the financial viability of a company which maintains a manufacturing facility on occupied territory, on land forcibly expropriated from several Palestinian villages. We would also like to point out that the Co Op, the UK’s fifth largest food retailer, has recently changed its ‘Human Rights and Trade Policy’ and is now committed not to deal with any supplier which operates in illegal Israeli settlements. The Co Op has taken a decision to cease its trade relationship with four companies – Arava, Mehadrin, Ada Fresh and Agrexco – in line with this policy. We would encourage B&Q to adopt a similar position and to cease trading with Keter Plastics.